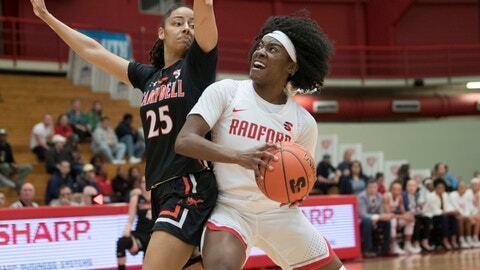 RADFORD, Va. (AP) — Lydia Rivers scored 14 points and grabbed 14 rebounds and Radford beat Campbell 57-45 on Sunday for a berth in the NCAA Tournament after winning Big South tournament for the first time since 1996. Radford (26-6) extended its school-record streak to 18 straight wins, including a program-record 17 conference games to claim the regular-season championship. It was Radford’s second Big South championship game in the past three seasons and 14th overall —winning 10. Khiana Johnson added 13 points for Radford, which also had non-conference wins against Temple, Virginia and VCU. Sydney Nunley had 10 points and eight rebounds, narrowly missing adding to the Highlanders record of 40 double-doubles this season. Radford scored the first 11 points of the second quarter to take an eight-point lead and extended it to 30-14 by halftime. The Highlanders outscored Campbell 21-2 as the Camels were 1-of-15 shooting. Neither team made a 3-pointer in the first half and Lauren Carter finally ended the dry spell at the 5:12 mark of the third quarter to get Campbell within 36-22. Khiana Johnson answered with a 3-pointer at the other end, and Radford finished 2 of 6 from the arc and Campbell 5 for 23. Hayley Barber scored 10 points on 4-of-17 shooting for Campbell (21-12). The Camels were just 18 of 61 from the field (28.3 percent) and attempted 16 fewer free throws than Radford. Campbell was seeking its first Big South tournament title since 1989.